Counter-service “food truck” parked at the entrance to Springfield serving above-par, grab-and-go tacos. One of The Simpsons quirkiest characters, Bumblebee Man, has fallen into the food truck craze! Place your order at his truck near the entrance to Springfield, then find your way to several outside seating areas with shaded tables and chairs, including the lagoon area near Duff Brewery — or, for a vast open space, backtrack to Universal Studios Florida’s Central Park (across from Woody Woodpecker’s KidZone). 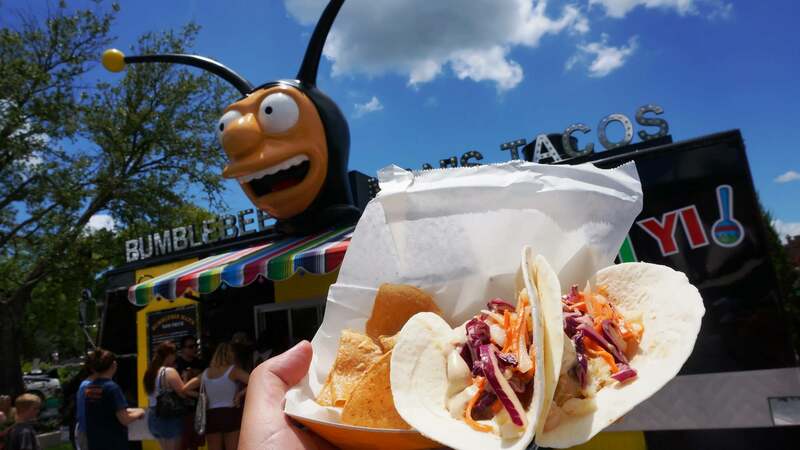 Bumblebee Man’s Taco Truck at Universal Studios Florida. Duff beer is only available in 12 oz. bottles from Bumblebee Man. If you’d like draft (just because you want more, or because you want to refill your souvenir Duff beer mug), grab your food and head over to Duff Brewery a few paces away. Depending on who is working the truck when you order, if you want to try two different taco flavors, you can order a combination of two different tacos. I am surprised this has not been turned into a restaurant! The tacos are great! The Korean "themed" or "inspired" tacos were absurdly awful. Skip these and go for the other tacos on the list which are way tastier. I sampled these tacos during Halloween Horror Nights and was pleasantly surprised! I tried the chicken, the Korean beef, and the carne asada tacos. The Korean beef was easily my favorite, though all three were fresh tasting and tasty. I would definitely eat here again! Bumblebee Man's Taco's are fresh and delicious! My husband and I had at least one every day during our 5 day trip. We tried each of the tasty taco's but we both agree that the Korean beef taco was our favorite. The warm Asian skirt steak paired with the cool cucumber and radish combination was absolutely delicious. Such a fresh flavor. It was very satisfying, on a hot day, without feeling heavy. We completed our meal with by sharing a Buzz Cola and a big pink frosted lard lad doughnut. We had such a nice time sitting on the benches near the taco truck, enjoying our food and people watching. Visit Bumblebee Man's taco truck if you are looking for something quick, satisfying and fresh.